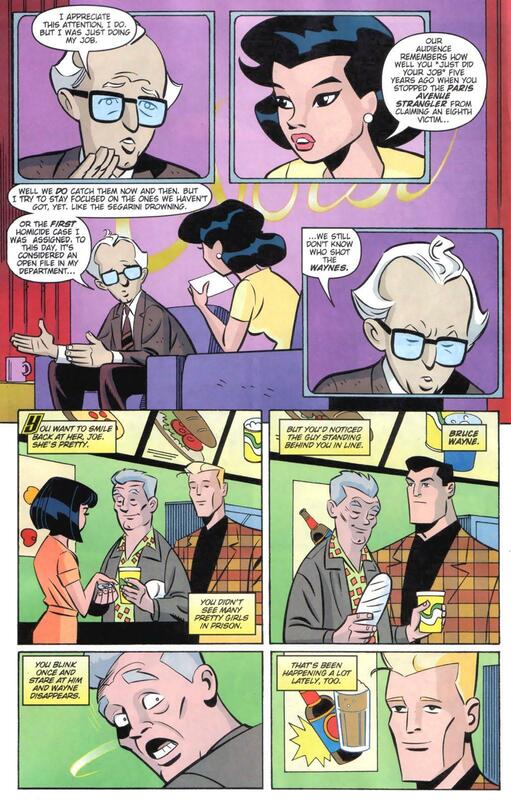 The story begins with someone having a nightmare about a mugging doing south, in which two parents are shot over a wallet and a pearl necklace, leaving a child orphaned... and the one having the nightmare is Joe Chill. Yeah, ever since that night he's been trying to keep his head down despite getting "that awful kind of celebrity" for killing the Waynes, but trying to fool himself into thinking that he's stil "the Iceman" in dealing with it. The truth is that the fear of being caught has been eating him alive for years not. Joe admits to himself that that's been happening to him a lot lately, and that it's bad enough that Bruce haunts his dreams, but he's starting to see him everywhere when he's awake too. He calls Bruce a reminder of his deepest regret, that he committed a double murder over a $200 necklace and that he left a witness alive. He tells himself that he didn't have the guts to kill a child, and now it's too late, he's an untouchable millionaire and it's only a matter of time before he remembers him and fingers him tot he cops. Batman later comes to the detective's apartment, and explains that Croc escaped from the prison ward he was sent too after the engine-block incident. He offers to move the detective somewhere else for his protection, reasoning that Croc is a simple man and revenge would be at the front of his mind. Especially since detective has been on TV talking about the arrest. 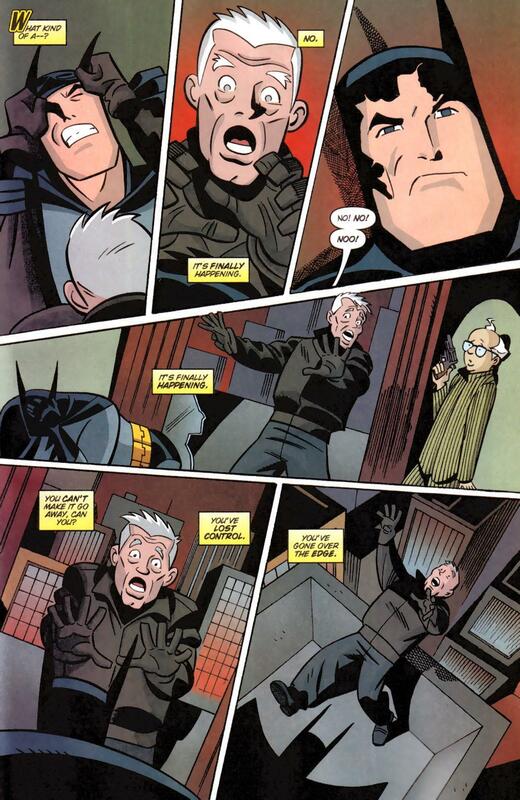 The detective tells Batman that people in the GCPD aren't cowards, and that he can take care of himself, especially since Batman still has a broken rib from the fight with Croc last week. 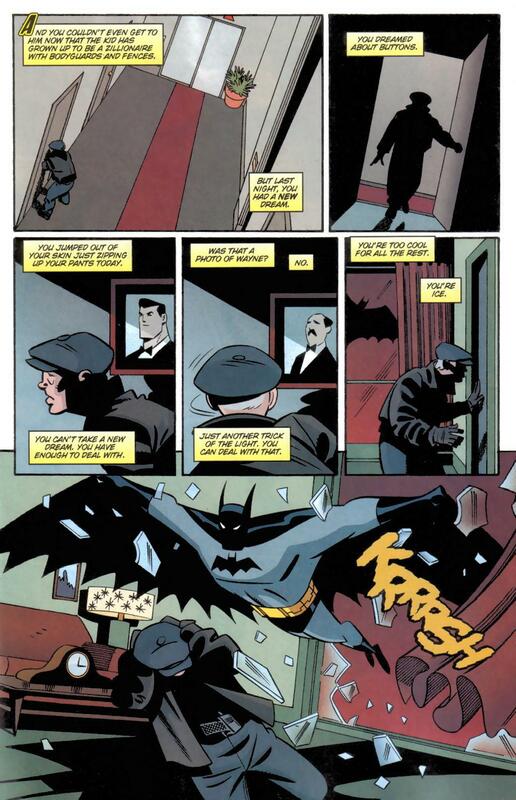 Batman apologises, which confuses the detective, and leaves. Joe on the other hand is starting to panic. He buys an untracable gun from a backalley arms dealer, who jokes to him about how Joe has a job to do or something. Joe flips his lid at the guy, telling him to shut up or he'll shoot him in the knees, which causes the gun seller to just burst out laughing and send him on his way, thinking that Joe is just some old loser. Joe looks up the detective in the phonebook (yes, he was listed. There's brave and then there's stupid...) and starts justifying to himself why he had to blow up on the guy, saying that he can't show fear or it'll all start tumbling out. He says how he used to think that he should just go and kill Wayne, and that would stop the dreams, which are getting worse as time goes on. But he couldn't bring himself to do it when Bruce was young, and shortly after the Wayne murders he was convicted for eleven years for some completely different charges, so he didn't have the chance then either. 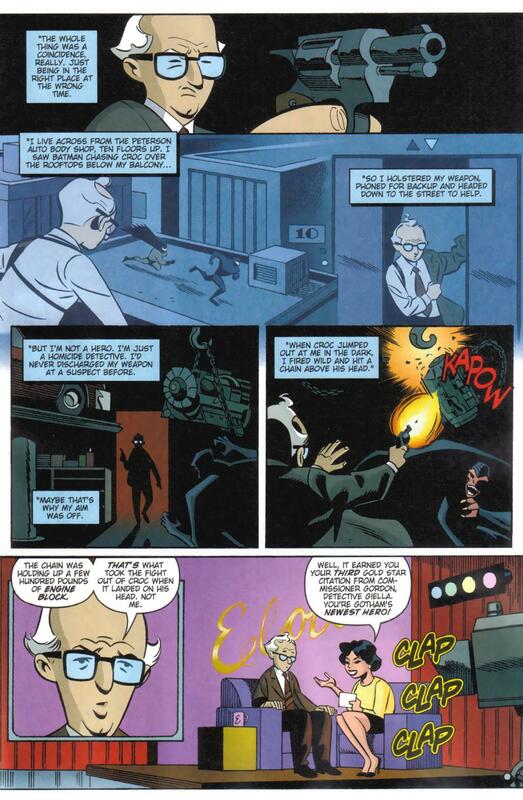 Batman, thinking that Croc sent him to kill the detective, demands to know where the supervillain is, while Joe is just mystified as to why Batman's there. Panicking, he chucks a clock at him, which against all the odds manages to hit him in the broken ribs. Joe, realising that Batman is favouring his right side, starts to repeatedly bash Batman in the busted ribs. 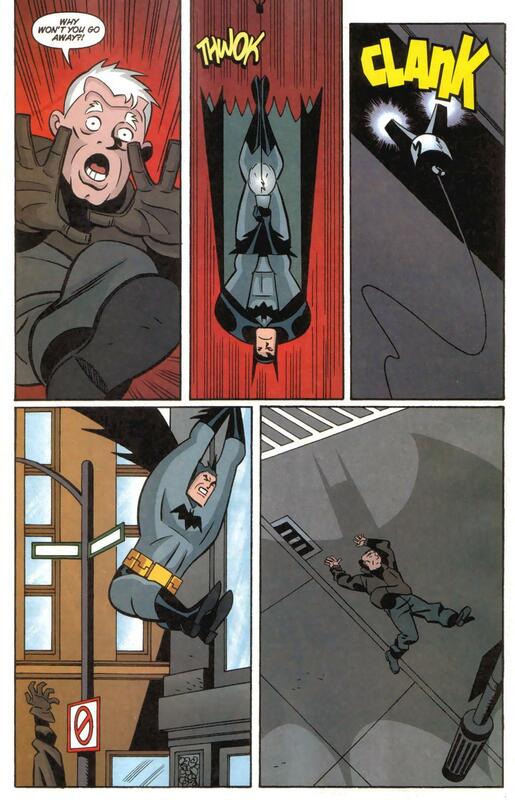 Due to the detective's distraction, the bullet ends up hitting Batman in the ribs... again, causing him to drop to the floor in agony. 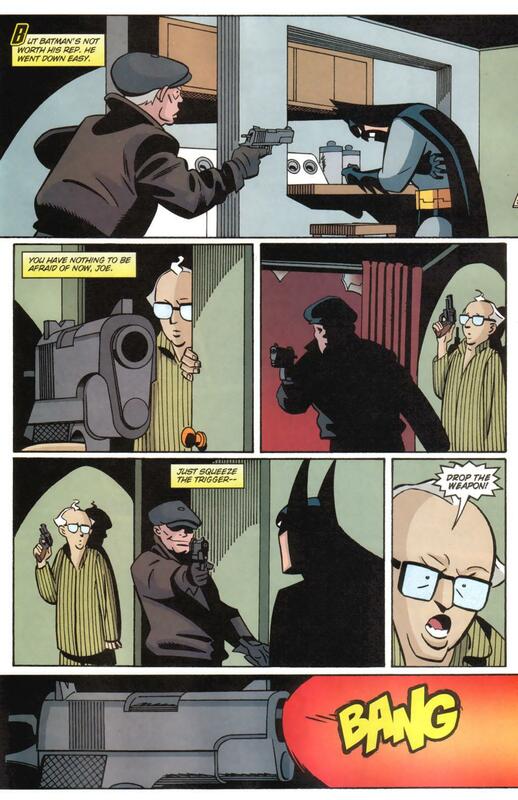 Joe then tries to shoot the detective, as he's the most dangerous man in the room now as he's also got a gun, but Batman grabs onto his legs and throws him off balance. 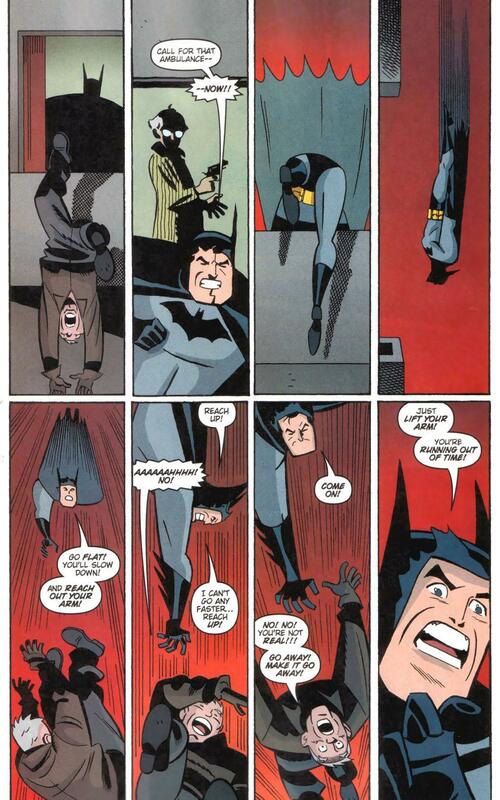 Joe grabs blindly at Batman as the wrestle on the floor, tearing his mask in the process. 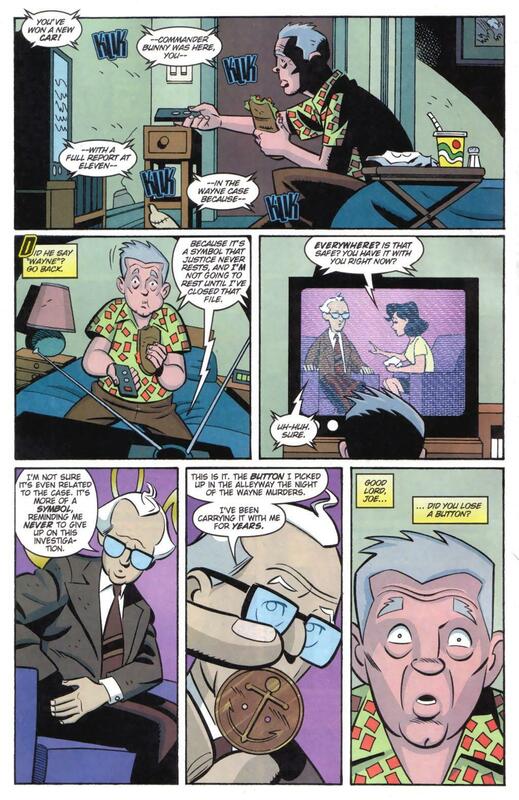 And so, DCAU Joe Chill dies. Bruce lands next to him, and says with blamefulment and grief "Why was he afraid to take my hand...? ".